I miss the bakery. The products, the smells, the people. But I don't miss that rising at 2 or 3am, after maybe 5 hours of sleep, and then slamming strong coffee, and telling my staff of 10 or so what to do for the next 8 hours. And other stuff. When I sold my store, in 1995, after 20 years of being in business, as president of Richard's Bakery Inc., and chief sheet pan washer, my friends and customers would say to me, "Haha Ric, you'll never be able to stay out of bakery business", to which I would politely smile, but inside, I was saying, "Haha, pretty damn sure I can". Your puff should be cold but not frozen. Put any unused puff back in the fridge for now. Pin your puff out such that it is about 1/16 of an inch thick. If you buy Pepperidge Farm Puff, the way it's folded will inform you how to use the 3 sections for your meat roll mixture. This next picture shows the pastry fully pinned and ready for the meat mixture. 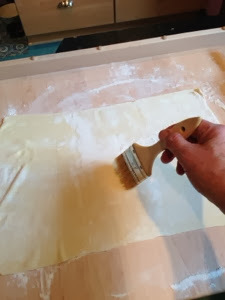 Brush off all the flour, cut the dough as shown with a knife (not serrated) or a pastry wheel. 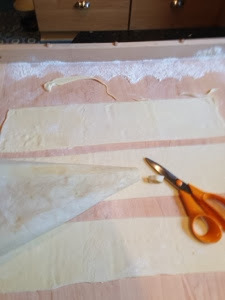 Cut the end of a cloth pastry bag to leave an approximate 1" diameter hole. 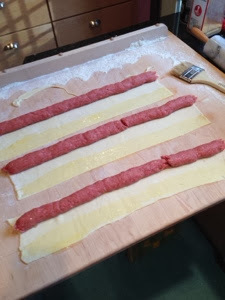 Add some of your meat mixture to the pastry bag, and pipe it onto the pastry as shown. 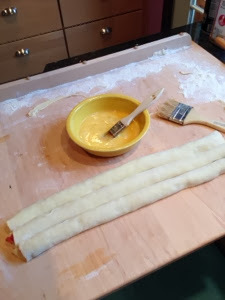 Whip a couple of eggs in a little bowl with a hand whip or fork, and brush it onto the pastry below the meat as shown. 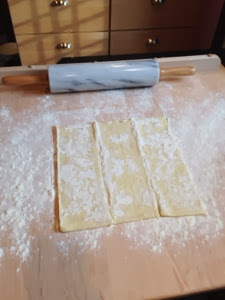 Then roll up the dough as shown below, and press the rolls lightly to seal the pastry to the egg wash.
Brush off any excess flour. 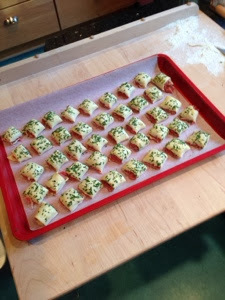 Then cut the rolls in about 1" pieces with a French knife or pastry wheel, egg wash them well as they sit right up against each other, and add dried parsley for color. Then pick them up and put them on your baking pan. Preheat your oven to 400 degrees and bake for approx 19 minutes. Note: This is my recipe, and it works great for me. 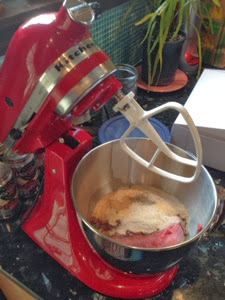 But maybe you'd like to try something different, like adding a portion of pork sausage or another change to the recipe. Go for it! Have a great party!!! Sounds tasty. You might want to add puff pastry sheets and parsley flakes to your ingredient list. 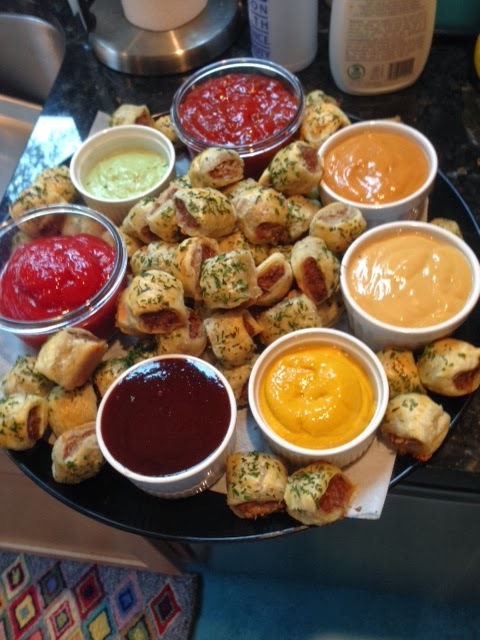 Reminds me of Fran's sausage rolls which hopefully will appear soon on a table near me. ok larry i am going to clean this post up now on my computer. I've been on the road and just got home. I wrote and uploaded the entire post and photos with my phone!